In recent years, Krakow has become a city with more and more innovative and creative initiatives in a number of fields. Until recently it attracted people with the legend: a treasury of Polish heritage, European Capital of Culture, a city bustling with events and rich in unique collections, which organises fantastic festivals and events. Krakow is one of the most recognisable cities in this part of Europe, a favourite destination for individual and organised tourism. In 2012, it was the only such city in history to proudly welcome as many as three football teams – English, Italian and Dutch – where they located their bases during UEFA EURO 2012TM. Several hundred journalists, tens of thousands of fans, press and national centres, three great stadiums – the city once again showed that it could handle even the biggest challenges. New convention centres and the unique interiors of historic buildings can provide support and give due weight to any event. Krakow also owes this ability to its friendly and professional hotel infrastructure, catering, entertainment and cultural attractions concentrated around the centre, and its proximity to Małopolska, offering countless opportunities for active recreation and unforgettable landscapes. Every year, reports are prepared on business tourism in Krakow, and in particular on the meetings industry. According to the report "The Meetings Industry in Krakow" in 2014, the capital of Małopolska held 3 976 events in this area. Of the group of congresses, almost half were accounted for by international meetings. Most meetings were organised by the academic sector and the finance, banking and insurance industries. The collected data shows that owners of accommodation and congress and conference centres in Krakow in 2014 hosted as many as 459 223 participants in meetings. Krakow – a city of five renowned universities – is one of the most important centres of education and research in Poland. The number of universities, students, the diversity of courses available, are an important measure of scientific potential. In the 24 institutions of higher education, more than 200 000 students are educated, and the teaching process is supervised by over 13 000 academic teachers, including 1,500 professors. This means that almost 13% of Polish academic staff are teachers in Krakow's institutions. A further 10 universities in Małopolska complement the wealth of opportunities on offer in the region. Every year, more than 50 thousand highly qualified graduates exit Krakow's universities. They do not disappear into a void: the city hosts numerous research and development institutions, whose cooperation with Krakow's universities and companies in the high technology sector contributes to the formation in Krakow of scientific research centres. The activity of Centres for Advanced Technology, Centres of Excellence, and Centres of Technology Transfer focuses on research work and the implementation of their effects and transfer of technology in cooperation with business. There are also clusters operating here – important from the point of view of the development of the knowledge economy. Krakow owes its economic attractiveness to the people living, working and studying here: they are the engine of economic development in the city. 800 000 people, including more than 60% of working age, creative, educated, and with above average knowledge of foreign languages, allow Krakow to be seen as a centre where it is worth locating business ventures. 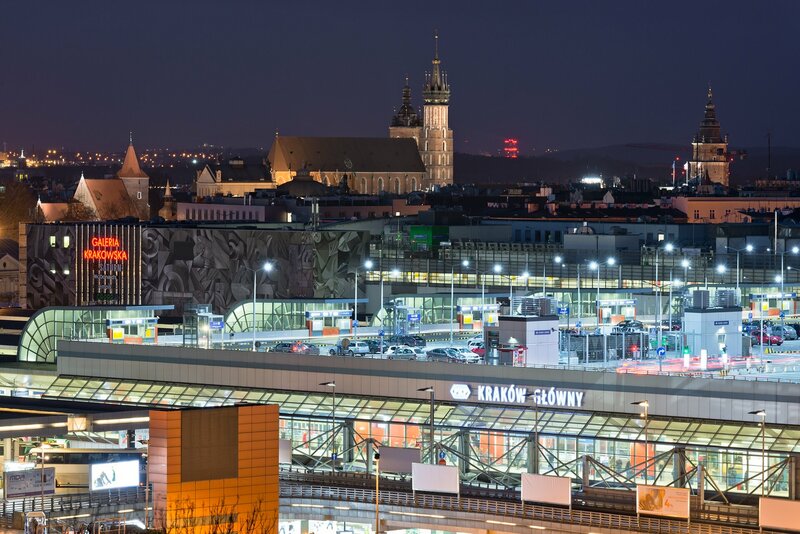 The more so that ever closer to Krakow – not only due to the A4 motorway but also in intellectual terms – is the huge Silesian agglomeration with its human, industrial and cultural potential (the cooperation of both conurbations has even led to the forging of the concept of "Krakowice"). In short, within a radius of 100 km from Krakow, there live 8 million people: more than one-fifth of the population of the whole country. The multicultural and multicoloured landscape of the environment strongly influences the imagination of entrepreneurs. It is hardly surprising that in the "Financial Times" report European Cities & Regions of the Future ranking 2012/13, the Małopolska strategy for attracting investment was – in comparison with other regions of Central and Eastern Europe – considered the best. Krakow's positive image is confirmed by the numerous foreign investments in the city, both for smaller companies and international corporations. The city consistently and successfully promotes itself as a centre of high technology and the IT industry. In the prestigious report by the independent Institute for Market Economics "Investment attractiveness of Polish provinces and subregions, 2011", the Krakow subregion finished second in Poland (after Warsaw) in the field of advanced technologies. The report also stressed Poland 's highest quality labour force, a large number of skilled workers, graduates and students, the very high standard of social and economic activity, and the availability of transport, social and economic infrastructure and the level of economic development and market capacity. The advantages of Krakow – the human and cultural potential, the R&D facilities, the convenient location and excellent infrastructure, are confirmed in the opinions of international experts evaluating the investment attractiveness of cities and regions. For years, Krakow has been appreciated in the Tholons Top ranking assessing global outsourcing centres: in 2012 it took 11th place, and second in Europe; while in the category of emerging cities it took a clear lead. The comfort of conferences or business meetings in Krakow will be enhanced by the urban facilities – full of open-minded people, interesting places and ideas. In a city where students are a quarter of the population, new ideas and views will always find an attentive listener. The academic and business setting and the professionalism of Krakow's meetings industry ensure that every subject will receive creative development here, and even the largest conference – the right place and time.